Google updated the Android distribution numbers today for the month of June, showing Marshmallow jumping past the 10% mark for the first time. I’d call that a significant milestone, but when you consider the fact that Marshmallow was introduced at the end of last September, 10.1% of the Android pie doesn’t exactly seem like enough. 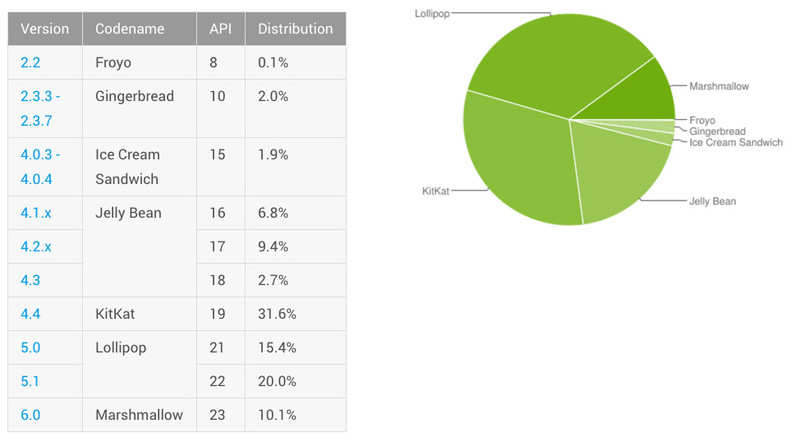 As for the rest of the numbers, Lollipop now sits at 35.4%, KitKat at 31.6%, Jelly Bean at 18.9%, Ice Cream Sandwich at 1.9%, Gingerbread at 2.0%, and Froyo at 0.1%. In case you were wondering, those are all down from May.